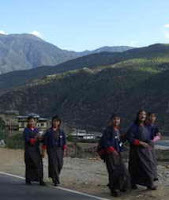 In Bhutan, men wear skirts. Seriously. They have sort of a robe thing that goes over a white shirt and the thick white cuffs folded back up over the robe. It’s a doozy to wrap and arrange, although the women’s long dresses made of one piece of fabric are more complicated. Men cover their legs with long black stockings and wear leather shoes. Youngsters don’t wear long socks, and do wear basketball style shoe or the heavy punk kick-ems. I wonder if the basketball style reflects the well-known fact that the fourth King of Bhutan i s a major basketball fan. 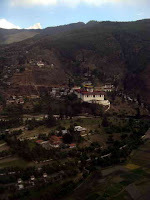 Bhutan, Bhutan. Land of the Thunder Dragon. Where have you been hiding. Here is as close to paradise as I’ll probably ever get. Nestled into 7000 feet of altitude with snow capped Himalayas towering on every side, Mount Jumolhari, home of the gods of the kingdom, fights off morning clouds as the sun comes over its ridge. Huge mountains of pine trees, water falls. No horrid traffic jams as in Kathmandu and India. No car horns and poverty and kids knocking on the car windows to get you to buy a magazine. Everyone is a farmer and so every piece of flat land is planted with potatoes (in flower now) or has been turned into rice paddies. At the Armankora (the Sanskrit w ord for peace and the Dzonghka word to describe a sacred circular pilgrimage) Hotel, (a sister to Amangani in Jackson Hole) a haven of simplicity in wood and window and natural fiber one can get one’s mind together, and deep breathe the first fresh air (the smell of ced ars and pines after a good rain) I’ve breathed since leaving Everest. Here birds can be heard, and there is no TV or extraneous noise. Only local dogs bark about normal things. Here in this Buddhist nati on ruled by a democratic King is peace. No wonder people put this on their dream list. At this moment, the 28 year old son of the fourth King, now called the fifth King of Bhutan, has been handed the throne. Thimphu, the capital, is being spruced up for the 100th year celebration of the monarchy (yea, constitutional monarchy now turned into a democratic system) and the coronation of the new King. A new two lane curving highway has been finished and buildings in the capital are hurrying up their completion to house tourists and curiosity seekers who will join in the festivities. The King, who is an absolute monarch with the power of life and death, emerged around the beginning of the 20th century from the tribes of warriors who had occupied Bhutan for centuries. In 1616 Shebdrung unified the country’s warlords into a dual system of government that paired with religion. The current King is the great-great-grandson of Trongsan, a great warlord, so he really does have the country’s history in his blood. The Kingship was actually set up by the British, who used Bhutan to set up trade with Tibet when Britain had India in its colonies. Even getting to Bhutan was like the beginning of an exciting novel. After a freak squall in New Delhi this morning, stopping up traffic like a sewer, people running into people, pushing t hem off their lane like a polo player rides off another to get the ball, providing nervous tension for those of us pushing to get to the international airport in time for our flight on the Bhutan national airlines. The sky finally cleared although the streets of Delhi were flooded, and the Ganges overflowing, (this is freak weather for them), so we took off on time with a brief stop in Kathmandu. 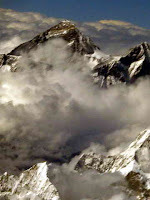 When we left Kathmandu, and flew high in thick white clouds, there peeking their peaks above the fray was the top sides of Mt. Everest, Mt. Lotse, and all the fellow mountains we had lived among during our trek, but this time we were looking at them from 30,000 feet. I wondered of Noam, one of our Sherpa friends guiding a 78 year old Japanese gent up the summit had made it, (it would be his sixth successful summit) since today was their day of reaching the peak of the highest mountain in the world. Everyone on the plane was on the left side gaping at the magnificence of the Himalayas and taking photos. I knew at that moment, things were finally going to change. And they did. Men and women are called Ap or Aum. I am Aum Audrey, which sounds kinda lovely. 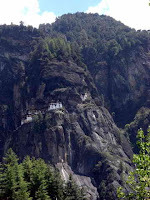 Taktshang Gompa, (Tiger’s Nest) which hangs off the face of a cliff 3000 feet above the valley floor - legend Guru Rimpoche flew into Bhutan on a mythical tigress, meditated in a cave before bringing Buddhism to Bhutan, and thus Gompa was built around the cave. You can get there on foot or on a tiny pony with a saddle made from yak skin. I chose feet with a wooden stick. It wa s steep and I’ve gotten out of shape since our trekking time, so we made it at least up to the café where we had a splendid view of the gold-guilded monastery. It had burned to the ground (from faulty yak butter candles) a few years ago, and has since been rebuilt on the extremely steep uninviting rock cliffs. 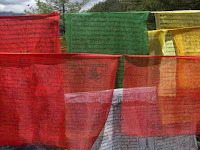 Getting there is following the prayer flags, which are strewn everywhere in their bright colors. 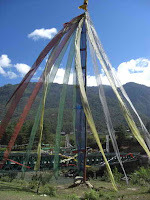 There are three kinds of prayer flags in Bhutan. The usual Wind Horse string of five colored ones representing the five elements: white for iron, green for wood, yellow for earth, blue for water, red for fire. There are the simple tall vertical flags - when someone dies 108 of them will be positioned somewhere on one of the mountains. And another flag on top of homes to ward of evil. On the brightly decorated three story homes (the roof floats and leaves an open space where farmers dry meat, crops, herbs, and laundry), one often sees a painted Phallus. This is to ward off bad news and evil presence. 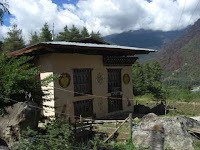 Bhutans believe if someone praises the home, that opens the door for something awful to happen, and so they paint a phallus on the front wall - and this covers any negative possibilities. Of course, I’m so entranced with these homes, I keep saying in my innocense, "Oh I love that one - with the tig er heads across the windows - sort of series of four or five cathedral windows in blocks of eight or ten. So I wasn’t helping the situation. 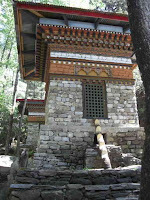 Also in Bhutan, where cheap labor comes from the Indians across the border, there are three kinds of chortens (the roadside monuments: the Tibetan with gold pointed tops, Nepalese which are round and white, and the Bhutan style, square with intricate painted wood patterns around it. (These are the spiritual thoughts around which you walk clockwise for luck.). In the mountains one comes across huge p rayer wheels as well, constantly moving because they are powered by wonderful surging water from the waterfalls everywhere. What a cool idea. Prayer is constant. We also visited the National Museum, (no photos allowed) which is Paro’s 340 year old watchtower, fortress and prison (the first king of Bhutan was imprisoned there) to view an enormous collection of Bhutan stamps and items of history. Bows and arrows were major weapons, and archery is still the national sport. At this time of year, yellow broom blooming everywhere gave it an enticing fragrance. Winding around seven round stories you find the p hilately collections to the wooden red hats, similar into style to the Pope’s, used by Dalai Lamas when riding horseback and my favorite, the Tshogzhing Chapel, which is a three dimensional Mandala, each of four sides elaborately carved with many figures and statues related to the Tantric Buddhism of Bhutan. It is like a huge tree in pyramid form with colorful monsters and Buddha forms and his consorts and manifestations and ugly protective multi limbed creatures. But I couldn’t stop thinking about the artistic stamps honoring world wide events and coveted by collectors, including three-dimensional ones, and some that change as you move them up and down. They also make little CDs to go with stamps and I’m told there is an Elvis one, which I couldn’t find at the museum. Photos: Men in skirts, the national dress of Bhutan; school girls in uniforms; a monk and an assistant at Amankora Hotel in Paro; vertical prayer flags; view of Paro on landing; Mt. 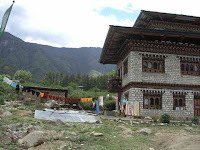 Everest from the plane; Tiger's Nest Monastery; colorful prayer flags on a hike; the phallus protection; a water turned prayer wheel in a typical Bhutan chorten; drying yarn. I hope that one day I will be able to make a trip like you. It is fantastic what you can experience in such a shot time. Becoming familiar with a different culture and rites must be amazing. All the best in you future travels.